Everyone dreams of having their own roof terrace. We could all enjoy a private, cozy space high above the streets with a breathtaking view if it weren’t for those pesky pitched roofs. 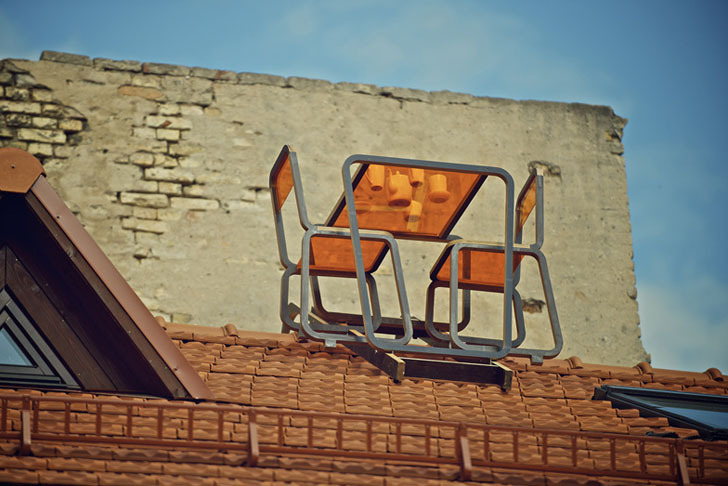 Lithuanian design student Aine Bunikyte is about to make those dreams come true with her fantastic and minimalist “Ridged Roof Furniture.” The design consists of a table and two chairs that attach to a ladder that bends down both sides of a roof’s central ridge, creating a sturdy dining set in the sky. While other members of her class were toiling away on interior designs, Bunikyte thought outside of the box (and house), defying the traditional sloping roof, for one of the most unconventional uses of space we’ve seen. Inspired by her ventures onto roofs as a child in search of quiet alone time, Bunikyte recognized the need in all of us for a space of our own. This need, as well as the undeniable joy of sitting high above a city, watching traffic and passers-by below, are easily evoked on almost any roof with the ridged furniture. The perspex table and chairs are lightweight and waterproof, and they’re also transparent, revealing the roof as a floor, rather than hiding the unique surface. The entire set is designed to attach to any building with a pitched roof and patents are currently in process for future mass production. 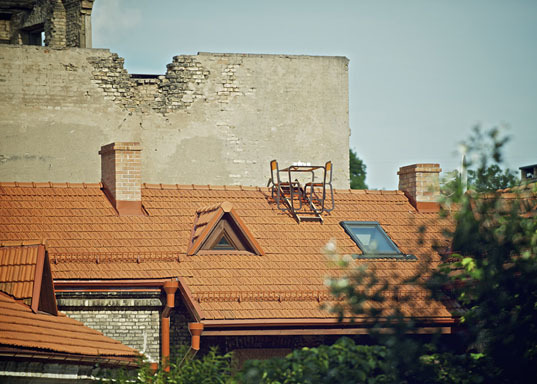 Bunikyte’s set is currently on view on top of the Uzupis Art Incubator in Vilnius, but is strictly BYO ladder. Everyone dreams of having their own roof terrace. We could all enjoy a private, cozy space high above the streets with a breathtaking view if it weren't for those pesky pitched roofs. Lithuanian design student Aine Bunikyte is about to make those dreams come true with her fantastic and minimalist "Ridged Roof Furniture." The design consists of a table and two chairs that attach to a ladder that bends down both sides of a roof's central ridge, creating a sturdy dining set in the sky. While other members of her class were toiling away on interior designs, Bunikyte thought outside of the box (and house), defying the traditional sloping roof, for one of the most unconventional uses of space we've seen.